So I finished my Saturday project, thanks to lots of help from my mom! I never could have done it without her. I found the pattern at Burda Style (link here). It's a free pattern, but as I got into it I discovered it was hard to understand, and was more complex than I wanted it to be. So with Mom's help, we changed a few things, including putting the zipper in the back instead of in the front under the flap (like who wants that extra bulk on their belly?). 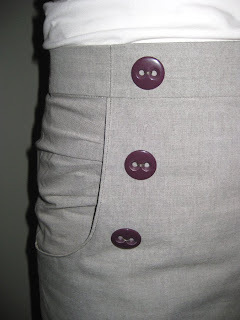 Also the pattern had these pockets in the back as well, which I thought would be wierd, so I eliminated those. From now on, I'm only making loose flowy clothing with elastic fabrics, 'cause this was kinda hard for me. I finished at 11:00pm. Oh, and if I were to do it over, which I never will, I would make the front panel a little narrower and the waistband taller. supa cute! yeah, burda...foreign...weird...not easy...go for a good old McCalls or Simplicity next time. well it turned out SO cute. I am definitely jealous.